Political analyst JAMES MARLOW brings The Jewish Weekly his weekly election report, latest news briefs and poll table. The most right-wing party on the Israeli political map will once again attempt to enter the Knesset on 9 April. Otzma Yehudi, meaning Jewish Strength, is seen as a descendant of the outlawed Kach Party led by Rabbi Meir Kahane who sat in the Knesset with one seat in 1984. During that term when there was a coalition agreement between Likud, led by Yitzhak Shamir and Labour led by Shimon Peres, it was the Likud that initiated legislation to ban Kach as they feared the party would take vital votes away from Likud. Labour were happy to oblige and Kach were banned from the Knesset on the grounds of racism. Rabbi Meir Kahane remained a high profile figure in the international arena due to his extreme views, but on a speaking tour to various cities across America in November 1990, he was shot dead after he stepped down from a stage in New York. One of Otzma Yehudi’s leaders is Hevron resident, Baruch Marzel, who was a Kach spokesman for a decade and then led its secretariat. The party’s co-leaders are former MK Michael Ben-Ari, lawyer Itamar Ben-Gvir and a former student of Kahane who is also the head of the anti-assimilation organization Lehava, Benzi Gopstein. In the 2015 election, Otzma Yehudit ran together with former Shas chairman Eli Yishai with his new Yahad Party at the time, but fell just over 11,000 votes short of crossing the 3.25% electoral threshold. This time the two parties are expected to run separately. It was reported that the Otzma Yehudit party have begun a fund-raising campaign via crowd-funding and are looking for rich American Jews who support their actions. Michael Ben-Ari has constantly criticized Defence Minister Avigdor Lieberman and Education Minister Naftali Bennett in a bid to take votes from them, claiming they are not really representing the right. But Lieberman’s Yisrael Beitenu faction said his party is essential to hold the government to account especially, as Lieberman put it, Prime Minister Netanyahu is not hawkish enough. In a press conference in Tel Aviv on the 20th anniversary of his party’s establishment, Lieberman, (with none of his MKs present) displayed the new campaign, including signs featuring an Israeli expression that translates either as “doesn’t give a damn” or some say, “won’t be cowed” – in other words the slogan cannot be translated into English. The list of people Lieberman says he won’t give in to are MK Ahmed Tibi, Hamas, Charedim, BDS and left-wing NGO B’Tselem. Lieberman also said his party is essential because Netanyahu “gets confused and surrenders,” as opposed to himself.He presented a chart that showed the times Netanyahu voted yes and Lieberman voted no: on the Gaza disengagement, releasing 1,027 terrorists in the deal to release captive soldier Gilad Schalit, apologizing to Turkey for killing armed activists on the Mavi Marmara, sending gas and millions of dollars to Hamas in recent months, a ceasefire after more than 600 rockets were fired into Israel from Gaza last November and the delay of the demolition of illegal Bedouin outpost Khan al-Ahmar. The election for the twenty first Knesset will be held on 9 April. A new poll shows that if Yesh Atid leader Yair Lapid joins with Tzipy Livni and her Hatnuah faction, Yesh Atid would jump from 12 seats to 17 seats. However speculation is still ripe that Lapid may still join with former chief of staff, Benny Gantz’s new party which could create the largest threat to Binyamin Prime Minister Netanyahu and the Likud. Lapid still insists he will head any merger whoever it is with and that he is running for Prime Minister. Yesh Atid and Labour also released their videos, with Yesh’s slogan being “What They Broke, We Will Fix” and Labour mocking both Gantz and Lapid’s adverts, and concluded by saying they will not join a Netanyahu-led government. Yair Lapid has said repeatedly that he would not join a government led by Netanyahu if he is indicted on corruption charges pending a hearing – a step that is expected next month. 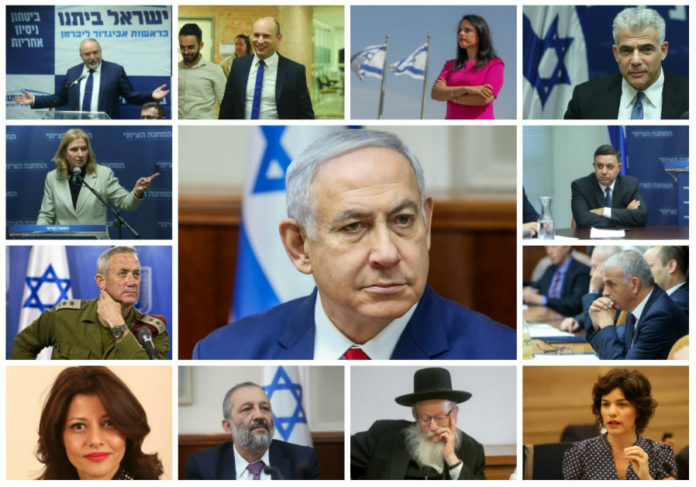 If Netanyahu is indicted, a new poll released by Army Radio this week found that the Likud would immediately drop by 4 seats and those votes would be shared amongst Yesh Atid, Israel Resilience and the Kulanu parties. Last week’s brand new poll table showed “months and years” instead of “numbers” in the current polling box. This was due to a technical error when transferring the document from one programme to another and The Jewish Weekly apologies for the confusion caused to many readers. We are therefore printing it again with slight adjustments due to an update and two new parties.